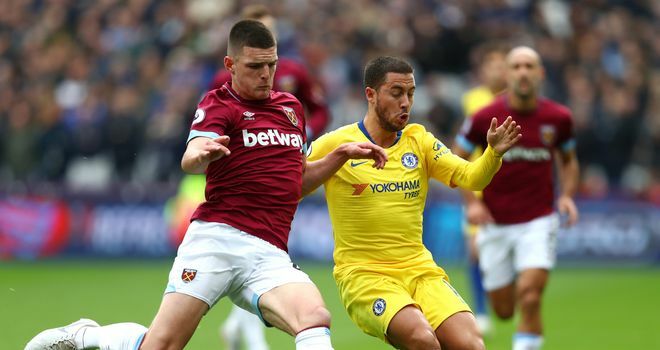 West Ham are confident defender Declan Rice will sign a new contract, according to Sky sources. The 19-year-old has less than two years remaining on his current contract, although the Hammers have the option to extend the deal by a further year. West Ham have been in talks with Rice since April, but are yet to reach an agreement with him on fresh terms. Rice was voted West Ham's young player of the year for the second successive season after featuring 31 times during the 2017/18 campaign. With Jack Wilshere out, Declan Rice has a chance to show Manuel Pellegrini that he is more than just a replacement in the West Ham line-up. Manuel Pellegrini has deployed Rice in a defensive midfield role this season, with the youngster returning to the first-team for West Ham's 3-1 victory over Everton earlier this month. He anchored the midfield once again during the goalless draw with Chelsea on Super Sunday. Rice, who is eligible to represent England, is yet to commit his international allegiance to the Republic of Ireland despite appearing in three friendlies for Martin O'Neill's side.